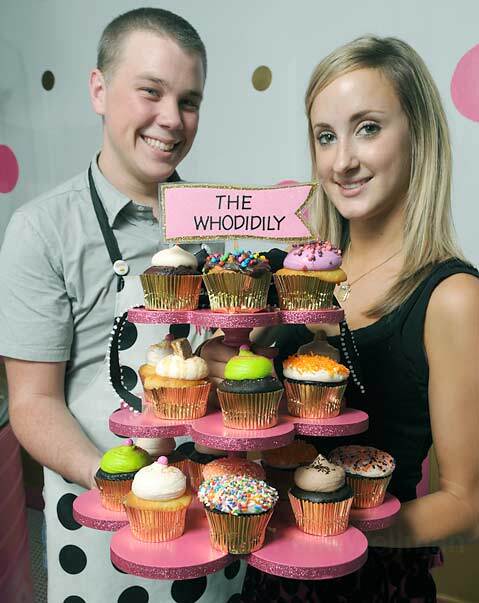 Creative cupcakes are what it's all about at Montecito's Whodidily, as displayed by Kody Molitor and Erin Laine. Where: 1150 Coast Village Rd., Ste. E; 969-9808; whodidily.com. What: Creatively constructed cupcakes for special occasions or desserts. How Much: Whodidily’s whimsical fairyland of sugared treats is self-described as “Willy Wonkaish with a dollop of Dr. Seuss.” In other words, take a world full of Dippity-Doo-Dah’s, Lickety Splits, and Scumdidily, and mix it with imaginative candy-factory goodies, and you’ll get a treat you will be happy to eat here or there or anywhere. Inside her Coast Village Road location, owner Wendy Jones frosts and blings out pillowy cupcakes with dollops of buttercream frosting, pink sprinkles, rock candy, Nerds, and even plastic dancing ballerinas (the Foo Foo La La Cupcake). Carrot cake, lemon cake, cinnamon cake, vanilla cake, chocolate cake, red velvet cake, or Oreo cookie cake are wrapped in a gold foil base with a popped-out top, frosted and candied. The Scrumdidily Cupcake is filled with a cookie dough center that oozes with chocolate chips and a moist cupcake containment. The Whodidily is a confetti cake with a cream center topped with fudge frosting and sprinkled with rainbow mini candy kisses. Whodidily also offers custom design services for birthday or wedding orders. So there’s no need to ask how to make a scrumdidilyumptious bar, just know that you were born to love it in a Wonka-rific way.